Enterprises today are turning inside out. Users that once used to sit within four office walls are now remote, distributed and accessing enterprise applications from multiple device types. Traditional remote access technologies were created twenty-years ago and don’t cut it in today’s business landscape. 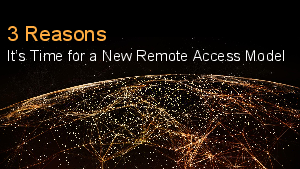 View this slideshare to understand 3 key reasons why now is the time for a new remote access model.